The DL3000 is a cost-effective programmable DC electronic load with performance specifications that rival any instrument in its class. With a user-friendly interface including graphical charting, the DL3000 series provides various interfaces for remote communication to meet your diversified test requirements. Test power systems and batteries with configurable static, transient, and advanced application modes. 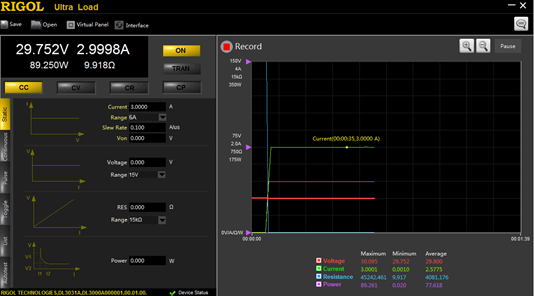 View the actual load performance on the front panel of the DL3000 in a static or transient mode. 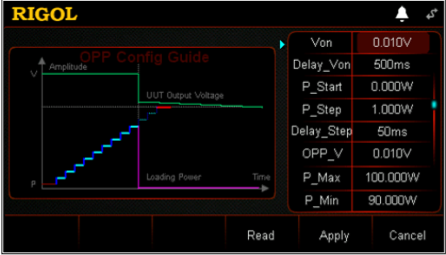 Optimize tests with customizable slew rates and frequency adjustments in Power, Voltage, Current, or Resistance modes. The advanced DL3000A models provide up to 5 A/us and 30 kHz frequency settings for transient mode testing. Emulate more dynamic real world power demands with this flexibility. That ultimately results in higher reliability and known behavior for batteries and power systems. DL3000 Series provide specifications and capabilities that make measuring your power system under different conditions quick and easy. 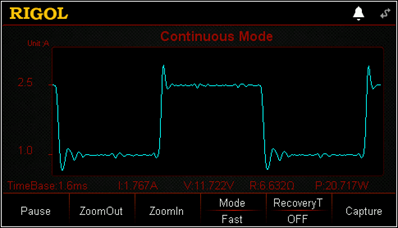 Monitor static conditions from the front panel or software interface and capture transient events with the built in waveform capture or by using an oscilloscope connected to the rear panel pulse shape outputs. The key to getting the most out of an electronic load is making it easy to configure for the tests you need to run. With specialized setups to conduct battery drain testing while measuring service time and capacity as well as sweeps to identify the most efficient test conditions for batteries and power supplies. Easily reconfigure or investigate the setup of the DL3000 remotely over USB or Ethernet with the free UltraLoad software. Record captured data over time and save long term test results to characterize and better understand your power system performance. Load input 60 A cable. Cable is 30 inches long. High Slew Rate Option for DL3000 Series Loads. Standard on DL3000A series instruments. High Measurement Resolution Option for DL3000 Series Loads. Standard on DL3000A series instruments. Terminal Shield for covering front inputs of DL3000 Series Loads. Clear Plastic. Digital I/O Triggering Option for DL3000 Series Loads. Standard on DL3000A series instruments. High Frequency Option for DL3000 Series Loads. Standard on DL3000A series instruments. Updates DL3000 Instruments to 30 kHz capability. Ethernet Communication Option for DL3000 Series Loads. Standard on DL3000A series instruments. Load input 20 A cable. Cable is 30 inches long. Load input 40 A cable. Cable is 30 inches long. USB-GPIB Converter. Connect USB directly to instrument and control it via GPIB. This does not connect to a PC directly. "-L' Model for DL3000, DG800, and DG900 series.